Our habits speak louder then our words. Its never too late to start developing natural health and healing habits. As a child of a chiropractor, natural health care was a normal way of life. My mother instilled in each of her children that chiropractic care natural diet and lifestyle was an essential part of are life. Therefore it was a natural transition in my life that I became a chiropractic to promote natural health and healing. I Graduated from the Canadian Memorial Chiropractic College in 2010. The wealth of knowledge I received has been so valuable in my clinical practice. During school I learned 3 things that have stuck with me and have been the basis of my chiropractic practice, they were: 1. The body is self healing and self regulating 2. All healing happens through the nervous system 3. Specific chiropractic adjustments release nerve interference which in turn helps the body function at 100%! If I’m not at the office, you can find me on the golf course and if I beat you I probably just had an adjustment. I also enjoy the sport of Judo which I have competed in since I was 8 years old. Some of memorable moments of judo competitions were winning the 2002 Canadian Nationals and also that year representing Canada at the Junior World Championships in Jeju, Korea. I receive regular chiropractic care to maintain a properly functioning nervous system. I enhance my own health through a weekly weight lifting routine as well Judo classes. Nutrition is also an important building block in my health and well being, but I do enjoy the odd cupcake once in a while. I would love to meet you. 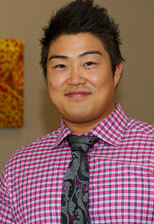 Please contact Noji Chiropractic & Wellness Centre or give us a call at (403) 381-7766 to begin your chiropractic care!